Two consignments of 540 Indian Soft Shelled Turtles (Nilssonia Gangetica) and Spotted Pond Turtles ( Geoclemys Hamiltonii ) were seized by the Mumbai International Airport Air Intelligence Unit. All these Schedule 1 species of turtles were handed over to the Maharashtra Forest Department. The smuggling of these turtles was done in a very cruel manner, which involved packing them in zipper bags, then wrapping them in plastic bags and taping them with transparent adhesive tapes. Various wildlife offences were lodged with the jurisdictional magistrates. The judiciary then accorded its permission to release the seized wildlife in its natural environs in the respective cases. Thane SPCA and RAWW (Resqink Association for Wildlife Welfare) started coordinating with the Forest Department from the very first hour of seizing the turtles, with logistical help. While RAWW assisted in the physical distribution of the turtles at Dahanu and Karnala and Thane SPCA’s wildlife veterinarian checked each of these turtles for their physical condition, Thane SPCA also admitted the sick ones to their hospital and started to co-ordinate for the most suitable spot for the release of the turtles. This would be the first interstate repatriation of rescued aquatic turtles in the country and needed intense coordination between all parties involved. Finally, Turtle Survival Alliance, an organization dedicated to saving turtles, was identified as the agency for the translocation. The Chief Wildlife Warden and the Principal Chief Conservator of Forests (Wildlife), Uttar Pradesh, accorded his approval for translocation and rehabilitation of the seized turtles at Kukrail Facility, Lucknow, from where, after a suitable quarantine, the turtles would be released in the Sarayu River. The translocation was carefully planned for May 23, 2015, which happens to be World Turtle Day. To prepare the turtles for the long journey tomorrow (courtesy Air India) each of them were numbered, checked by Dr Deepa Katyal, our wildlife veterinarian and packed individually in netted bags. Each turtle was adequately hydrated and kept comfortably in well ventilated crates. 23 such crates were prepared. They will be hydrated every four to five hours until their unloading at the Cargo point tomorrow. Thane SPCA is privileged to carry the turtles to the airport in their ambulance at the request of the Forest Department. 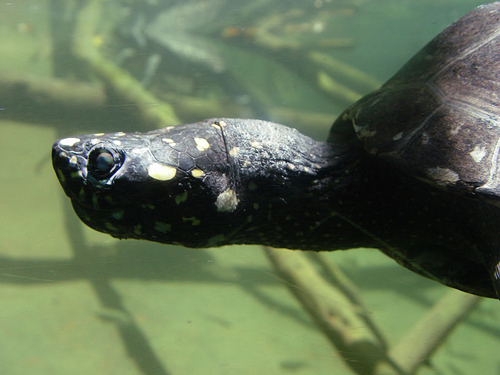 Five weeks after they were seized, the turtles will swim free in their own natural habitat, thanks to the incredible example of co-operation between Government departments and the Non Governmental sector, dedicated to saving the lives of these small creatures, so vital for the health of our ecology. We wholeheartedly thank the Deputy Conservator of Forests, Thane Shri K. Thakre and the staff of the Forest Department, the PCCF and CWW (Wildlife), Uttar Pradesh, the officers of Turtle Survival Alliance, Air India and the staff and volunteers of Thane SPCA and RAWW for making this relocation an unprecedented success. Top photo: Howard Cheng / Wikimedia Commons / “This file is licensed under the Creative Commons Attribution-Share Alike 3.0 Unported license.” / Spotted Pond Turtle. Second photo: Courtesy of Thane SPCA / RAWW volunteers cleaning a turtle tank. Third photo: Courtesy of Thane SPCA / Courtesy of Thane SPCA / Counting, numbering and packing the turtles. Fourth photo: Courtesy of Thane SPCA / Turtles all packed and ready for airlift. To visit the Facebook page of RAWW, click here.